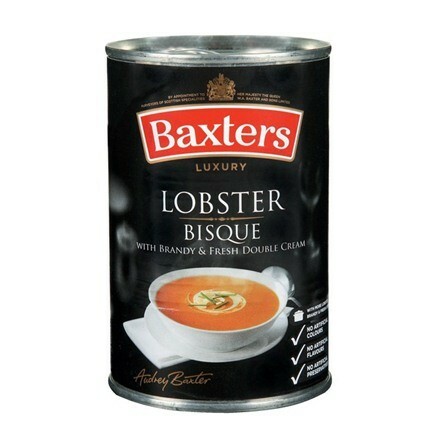 A delicate mix of Atlantic lobster, white wine and Scottish cream creates a truly special smooth creamy sophisticated soup. Ingredients: Water, double cream (5%), lobster (4.5%), cod (3.5%), Scampi (3%), onions, white wine, concentrated tomato paste, cornflour, skimmed milk powder, butter, brandy (1%), sugar, yeast extract, shrimp powder, fish powder, vegetable oil, vegetable extracts (with celery), stabiliser (polyphosphates), salt, thyme, concentrated lemon juice, mixed peppers, spices, spice extracts (with celery). Contains fish, shellfish, milk, celery.